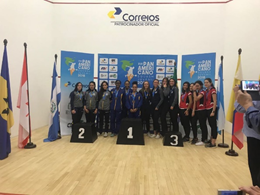 Barbados Junior Squash Team has been declared the Overall Champions at the XVI Pan Am Junior Squash Championships 2018 in Brazil after gaining 2 golds and 1 silver at the prestigious major junior event where they seized the most gold medals of the thirteen participating countries. 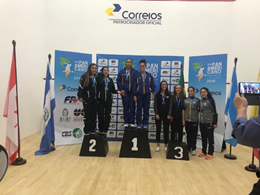 The Girls team of Meagan Best, Amanda Haywood and Jada Smith-Padmore sealed the deal in the Girls team event today after they defeated Ecuador in the Girls Team Finals. The Bajan girls proved a force to be reckoned with when they dismissed two high-ranked teams; Canada & USA while making their way to the finals against Ecuador. This was the third medal and second Gold captured by the Bajan Gems. Meagan Best seized Silver in the Girls Individuals category and the Girls duo of Best and Amanda Haywood claimed Gold in the Girls doubles category. To top it off, the trio team of Best, Haywood and Jada Smith-Padmore displayed sensational team-work and strength to gain the final Gold in the Girls team category to be adjudged the Overall winners of the Pan Am Junior Championships 2018. The boys team also put up a strong fight being short-handed but wasn’t enough to make the medal podium. 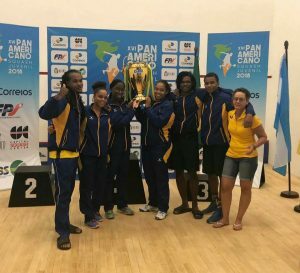 This team has definitely made their mark in Brazil and brought glory to BARBADOS on their first appearance at a major junior championship. The support of the National Sports Council and the Barbados Olympic Association played a major role in the team’s achievements and we want to publicly thank them for their continued support. A Special thanks is also extended to the President of the Barbados Netball Association, Mrs Nisha Craigwell who came to our assistance in lending us their national tracksuits attire at short notice that we may make a presentable national appearance on parade and on the medal podium. Girls Team of Jada Smith-Padmore, Meagan Best and Amanda Haywood receiving their Gold Medal. From left, Team Ecuador, Team Barbados, Team USA and Team Canada. “This is indeed a historic moment for Junior Squash and it is clear that we are doing something right despite our challenges of facilities. I believe that it has a lot to do with the Association putting our Athletes at the forefront and having faith in their abilities even at Major Events such the Pan Am Championships as well as the dedicated group of parents. Our athletes are very talented, and they will need all the support they can get to continue to grow and be competitive at high levels. 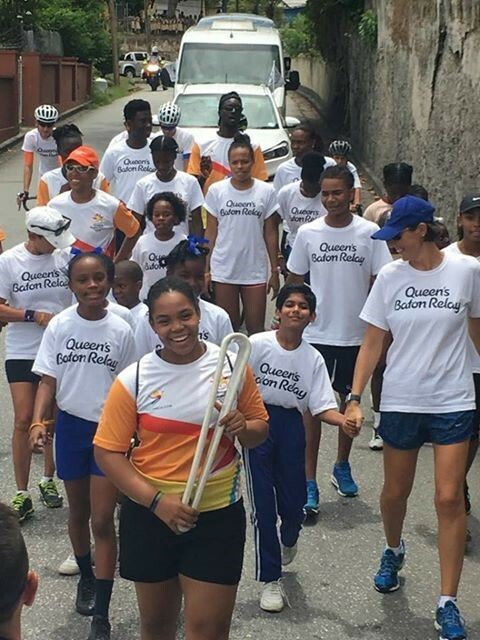 We have an emerging crop of junior athletes who are in dire need of more court time and access to greater resources to develop their skills and the Association is committed to meeting these needs with the assistance of willing donors and sponsors” – Alison Smith-Padmore, President Barbados Squash Association. 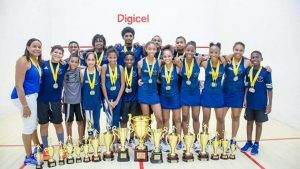 The Barbados Junior Squash Team dominated the 2017 CASA which were held in Guyana, winning both the girls and the boys team event and running away with the majority of individual age group medals(GU11 Gold, BU11 Bronze, BU13 Silver and Bronze, GU13 Gold, GU15 Gold, BU17 Gold, GU17 Gold and Bronze, GU19 Silver, BU19 Gold and Bronze) .